In recent years, community–academic partnerships (CAPs) have gained traction in academia as a method for bridging the research-to-practice gap and reducing health disparities for marginalized populations. The field of social work may be well poised to enhance its ability to engage in partnerships and research around partnerships given its emphasis on conducting practice research and its historical roots in boundary spanning. 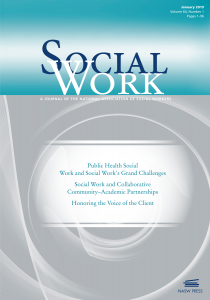 In an article in a recent issue of the journal Social Work, published by NASW Press, the author Danielle R. Adams, begins by defining collaborative partnerships between academics and community stakeholders and then states specific advantages and challenges to collaborative partnerships in the field of social work. Throughout, Adams explains how the historical foundations of the field (for example, acting as boundary spanners, advocating for marginalized individuals) place social workers in an ideal position to become leaders in the development, sustainment, and strengthening of CAPs. Adams details the ways in which social work researchers can use the field’s unique history to enhance the development and sustainment of CAPs. The article concludes by encouraging the field to use standardized terminology, methodology, and evaluation procedures when conducting CAPs and providing strategies for social work researchers who wish to increase their ability to develop and sustain CAPs within their own institutions.